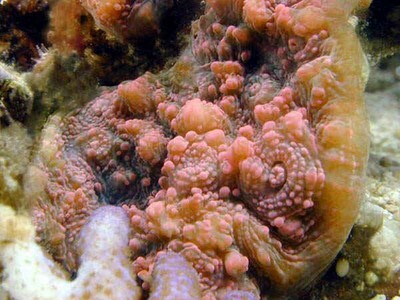 Not too many hobbyists are familiar with the corals of the Echinophyllia genus, from the Pectiniidae family. In many ways, that’s not surprising. It’s received very little mention in aquarium books, which is understandable considering how infrequently Echinophyllia shows up for sale. Even when it is available for purchase, though, most hobbyists usually won’t give it a second look. It usually comes in as a very drab brown or gray, with no trace of another color to be seen. It has neither swaying tentacles to attract the eye, nor does it expand greatly. In short, when freshly imported, these corals are easy to dismiss as blandly colored lumps. The aquarist who purchases one is in for a rather pleasant surprise over the weeks to come. Echinophyllia colors up remarkably in the home aquarium, almost invariably and without exception. Drab grays and solid browns become fluorescent hot pinks, reds, oranges, greens or blues. The coloration they display is amongst the brightest, most vivid and remarkable I’ve ever encountered with a coral. Strong halides do bring out somewhat better colors, but even VHO and power compact lighting seem to bring about this dramatic coloring up. 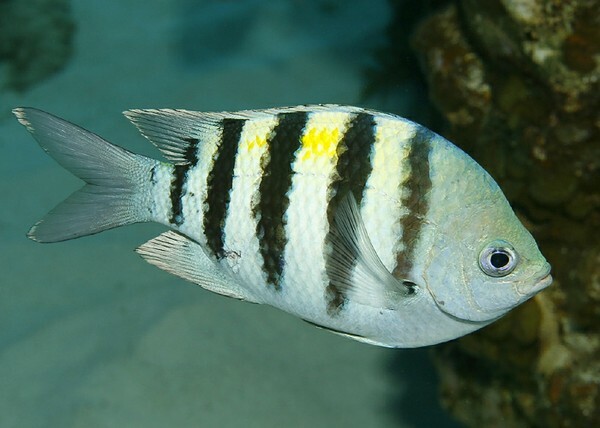 The accompanying photos give an idea of the sort of coloration Echinophyllia commonly displays in the aquarium. Some may suspect the accompanying photos to be retouched. Not only are they not, I assure the reader that if anything they fall short of accurately depicting the vivid coloration of these corals. As many who have kept them have encountered, they’re an instant attention grabber sure to draw the immediate interest of those who see them in captivity. Husbandry of Echinophyllia corals is remarkably straight forward. They are hardy, easily among the most undemanding corals I’ve encountered. Current doesn’t seem to matter at all to them one way or the other, just so long as there’s enough to keep sediment and detritus from accumulating on their surface. They can survive quite easily in a low-light environment; I once lost a frag of one behind the rockwork in my tank. A year later I rediscovered it and, while it hadn’t grown much and its colors had faded a bit, it was perfectly healthy. Nevertheless, they do seem to thrive on bright light and this should be provided if possible. Echinophyllia species are not fast growing, but as they grow outward from all around their edges a large colony can nevertheless produce a significant amount of new growth every year. Fragments can be taken, and in my experience the easiest way is with a straight-edged razor blade. With the blade perpendicular from the edge of the coral, cut inwards about an inch. Repeat about an inch away from the first cut, then snap off the section between the two incisions. Even small frags tend to be extremely hardy and easy to acclimate, but with Echinophyllia’s slow growth rate it can be some time before they grow to any appreciable size. Another oddity of Echinophyllia is its growth method. 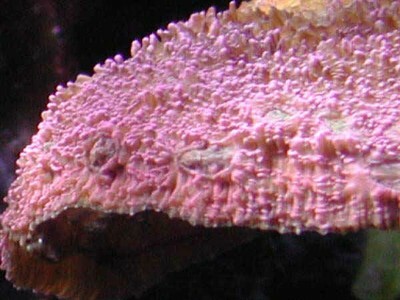 The same colony of Echinophyllia will often demonstrate both encrusting and plating behavior. 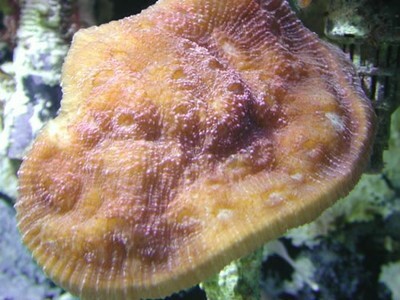 The edges of a colony that are placed against another object such as a rock or the aquarium’s glass will encrust onto that object, laying down only a very thin layer of skeleton beneath it’s fleshy polyps. Edges of the colony that are not near any other object will plate outwards, forming a much thicker skeletal base then in areas where it encrusts. This dual growth pattern often results in very unusually shaped colonies, or colonies typical of one growth extreme or the other. This can be seen by comparing the accompanying photos of Joe Kelley’s Echinophyllia which is very flat to those of John Subsillia’s, which is contorted enormously. Echinophyllia can be fed, but only at night. The only time I’ve seen feeding tentacles emerge is after dark, and the coral remains unresponsive to attempts to feed it during the day. Small pieces of food of many types (brine shrimp, mysis shrimp, chopped slivers of silversides, squid, etc) are accepted with relish, although only in small quantities by each polyp. One of the few drawbacks of this coral only manifests itself at night as well. Like Galaxea, Echinophyllia is capable of producing tremendously long sweeper tentacles. I’ve observed them at over a foot in length on occasion. Unlike Galaxea, Echinophyllia does not seem to produce these sweepers with regularity. More often then not, when I’d observe mine at night, I do not see sweepers in evidence. Nevertheless, they are present from time to time and are capable of causing significant damage to nearby corals. The other drawback to Echinophyllia is a subjective one that may not apply to anyone but me. I found that after only a relatively short time I became very sensitized to Echinophyllia, to the point where I can’t handle a piece with my bare hands without rapidly feeling discomfort and pain. In my years of keeping corals, no others have managed to produce this reaction from me. It is entirely possible that others will not have the issues of handling Echinophyllia that I do, but I nevertheless urge others not to handle the coral more then necessary for this reason. It is always a good idea for reef keepers to wear protective rubber gloves when handling corals. Identifying Echinophyllia can be tricky, especially if one is armed only with photographic references. From photographs, it’s very easy to misidentify Echinophyllia as Echinopora. If one is able to compare the two in person, however, the differences are unmistakable. The principle difference is the size of the polyps themselves. In Echinopora, polyps are small, perhaps an 1/8th of an inch in diameter. Echinophyllia polyps by comparison are usually much larger, up to around a half inch or so. Echinophyllia also has a very spiky or bumpy surface, as detailed in the above photo of Joe Kelley’s coral. It has also been confused with Mycedium in at least one popular aquarium book. Identifying Echinophyllia to the species level is beyond me, but seems to be of little practical benefit. Those I’ve spoken with who have an Echinophyllia all report about the same experiences, so husbandry seems to be pretty much the same for any and all Echinophyllia species in the trade. Another photo of John Subsillia’s Echinophyllia. Photo: John Subsillia. Identification isn’t the only tricky thing when it comes to Echinophyllia; finding one to purchase is not at all easy, either. Probably because of how drab they initially look, they rarely show up as wild-collected specimens for sale. On the flip side, for the same reason on those occasions when a store has one in stock there’s rarely much competition to acquire it and the price is usually quite low. A more sure-fire way of acquiring one is finding someone with a colony to purchase a frag from, although even this can be difficult because of both its general rarity and its slow rate of growth. Only one dealer I know of (Steve Tyree of Dynamic Ecomorphology) offers Echinophyllia frags with any degree of frequency. A few hobbyists I know offer frags from time to time as well – often under colorful names like “the Pink Thing” – but not many have large enough colonies to be able to do this often.